I have a new guest reviewer tonight, known as CreativeSuite. Hey, don't ask me, ask him! Take it away! Hello all! 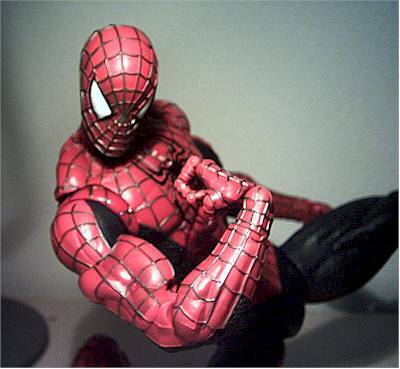 CreativeSuite here with my first guest review of the new 18" Ultimate Super Poseable Spider-Man figure. Along with the regular smaller line of movie-related toys, Toy Biz is giving the collector something different with this impressive figure from Spider-Man 2 (to be released July 2nd. 2004). Now, normally I don't collect a lot of comic related figures. I'm more of a "McFarlane, Star Wars, Lord of the Rings" kind of collector. But when I saw this Spider-Man, hidden in a bottom shelf at Target with packaging claiming 67 points of articulation....I just could not pass it up. Does it live up to the hype? Read on and find out. When carrying my "67-points of articulation" figure to the register, I KNEW all eyes were upon me. Why? Because his box is HUGE! Not that it's a bad thing. He's a big figure, and I like the fact that the front window is large enough so you can actually see all the detail and points of articulation. He's in a great pose (like he's sticking to the side of the box and about to shoot a web), and I like how they have pictured various poses shown (of the figure mind you, not drawings) to give you an idea of what this guy can do! 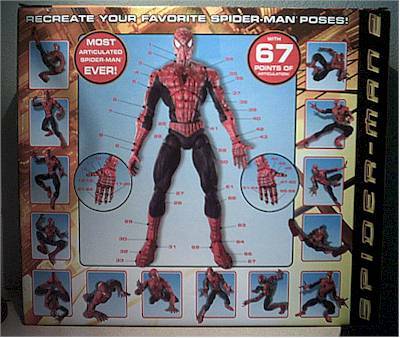 On the back of the package shows all 67 points of articulation! 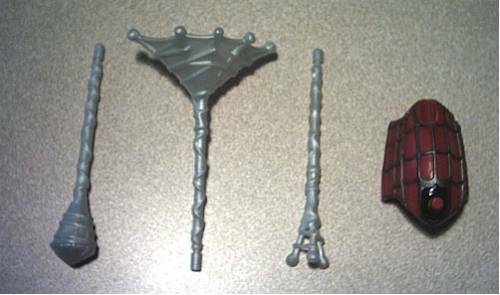 These are actually numbered, so you KNOW Toy Biz isn't gonna cheat you out of that magic number. Why only three stars on the packaging? My god the twist-ties. My god. I thought McFarlane's APU had an evil amount of twist ties, but Spider-man here is tied down so tight, you would think Toy Biz was certain he was going to bust right out of the box! 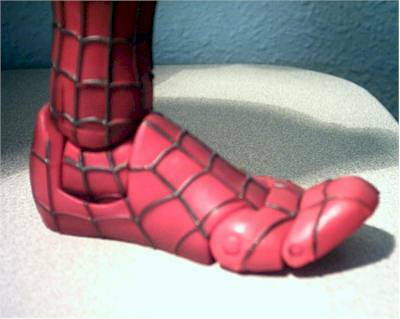 (Note to Doc Ock: Spider-Man is immobile when tied-down with twist-ties. Just FYI for next trap.) 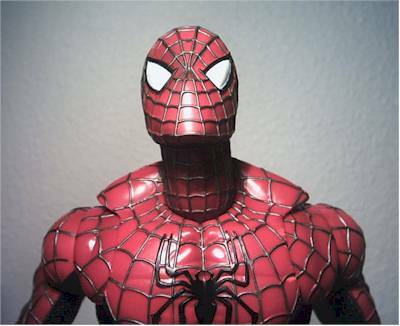 While un-twisting Spider-Man from his cardboard prison, I wondered to myself how much money would be saved by toy companies just developing a better way to keep toys in the package without twist ties. And then I remembered, the Japanese have already done it! As I reached that last thought, Spider-Man was at last free! Wow. Fantastic sculpt. Not too buff, and not too lanky. For those of you wondering if this is like one of the roto-cast figures, think again. This thing has serious heft to it. It's very solid, and is a full 18� tall. All the webbing is detailed, as well as the "wet-suit" type material in the blue areas of the suit. The most interesting thing about the sculpt, (and it took me a few minutes to realize this); there are no exposed joints or screws. Except in the fingers, where I can excuse that because of the size. My only complaint is the odd shoulder sculpt. It almost looks like he is wearing a high collar under his suit. But this is caused by the gap where the ball-jointed arms are. 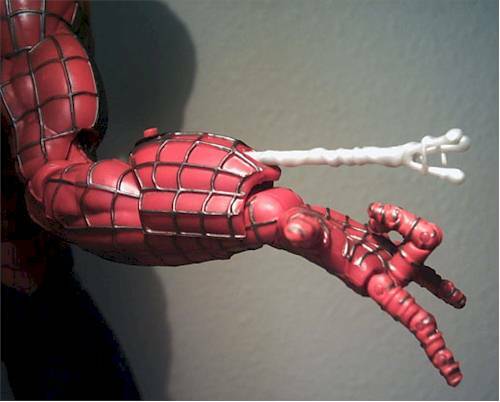 Other than that, this is the best sculpt of Spider-Man I have ever seen. Some slight areas of sloppiness, but nothing that detracts from the figure itself. The areas of slop are on the leg of the front spider on his chest and the leg of the spider on his back. One aspect of the paint that I really liked, was that they gave a pearlescent wash to his eyes, giving them a hint of sparkle. That is an excellent touch. Yes, Toy Biz delivered. This figures has remarkable articulation. EACH KNUCKLE OF EACH FINGER is articulated. Double knee and elbow joints, ball and socket arms and legs, DOUBLE ball and socket head, TWO toe joints, forward shoulder joints�I could go on�but you get the idea. 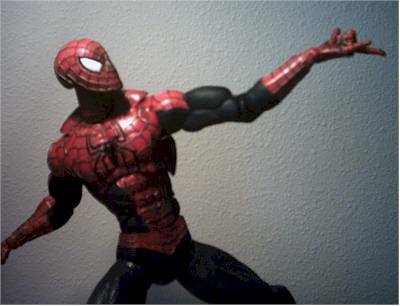 If there is ANY figure that deserves this much articulation, it�s Spider-man. It�s almost sick how many poses you can put him in. You may think you can leave him on the shelf in one pose, but you�ll look at him and think, �ohhh�that pose would look cool too�, and then you�ll change him. In fact, his toe articulation is so good, that I brought him over to a friend�s house to show him off, and my friend posed him hanging by just his toes! He looked fantastic! One incredible aspect of the articulation is the fact that all the main joints (elbows, knees, ankles, torso, arms, hips) LOCK solid into place via a very tight clicking mechanism. 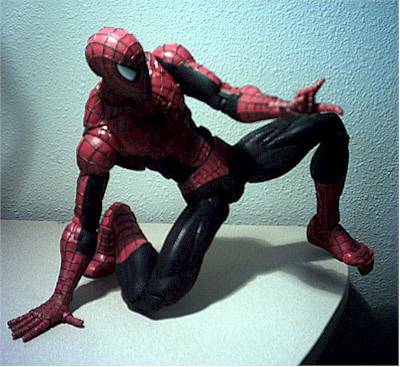 This allows Spider-Man to maintain some of the more complex poses. All the joints feel solid when clicking into place, although it�s sometimes a bit hard to move at times because the joints are so tight. Because he is big and solid, Spider-Man is QUITE heavy. So, his balance isn�t 100% perfect. But with some proper ankle positioning, you can get him to stand in most any pose. Hats off to Toy Biz on pushing the limits on articulation. I�m actually impressed that they managed to include ANY accessories with this figure, but they did. 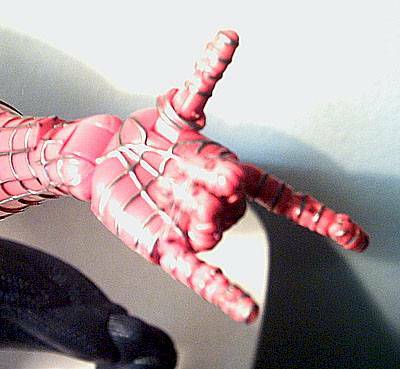 Included with Spider-Man is a clip-on wrist web-shooter. The shooter comes with 3 different �web-projectiles� that fit nicely in the shooter, and get some pretty good distance when fired. The clip-on shooter is done in the same style as the costume, so it doesn�t detract from the overall design. Giving it some thought, I couldn�t think of anything else I would have included with this figure. I found mine at Target for $24.99. 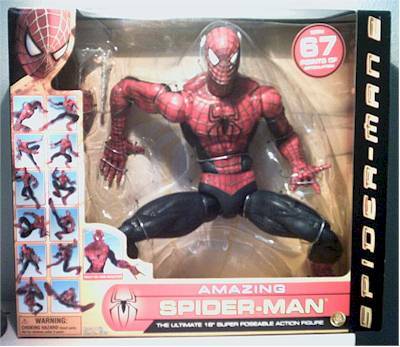 At first I hesitated at this price, but with 67 points of Spider-Man articulation, I couldn�t pass it up. After seeing the quality of detail and the amount of articulation, I can justify the higher price-point. Although paying $19.99 would have made me not even think twice about this purchase. After taking him home and playing with him, I would have gladly shelled-out $30.00 for this amazing figure. What can I say? This is the largest articulated figure I have ever seen. It delivers on every count, and will look fantastic on your shelf. Granted he is bigger than the roto-cast and other Marvel large-scale figures, but it sets a standard that I hope Toy Biz will continue with. The ONLY thing that could make this figure any better would be an 18� Doc Ock figure (complete with mechanical arms) for Spider-Man to fight. Toy Biz, if you are reading this, please please please make that figure. I got my Spider-Man at Target, so I would think most major chains like Wal-Mart and TRU will be having him as well. Haven�t seen him listed on any on-line retailers, but keep your eyes open. Figures from the collection of CreativeSuite.